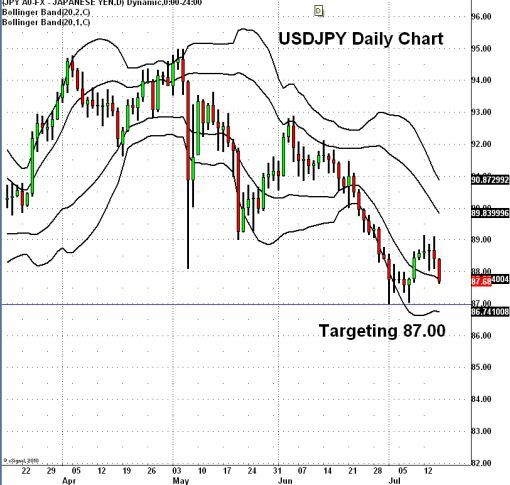 Over the past 48 hours, the U.S. dollar has come under aggressive selling pressure and I think USD/JPY is set to test its year to date low below 87. 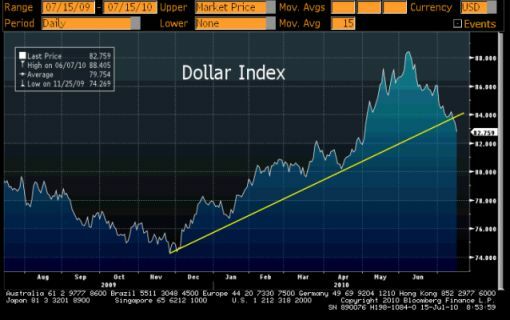 Here is a chart of the Dollar Index that shows a break of a major trendline which suggests that the dollar’s weakness will not be limited to just the Yen. I meant to post this yesterday but got caught in FX360 work. Sorry! U.S. fundamentals have taken a turn for the worse with retail sales falling short of expectations, manufacturing activity slowing and producer prices falling. Even the Fed who normally prefers to assure investors has turned pessimistic! This means that not only will the U.S. central bank leave rates on hold for the remainder of the year, but in the context of improving economic data and successful bond auctions in Europe, fundamentals have made the dollar has attractive. As a result, I think that USD/JPY is headed for at least 87.00.